Goldoffer.online is the PUP that uses misleading techniques to prevent removal. Use Reimage to locate malicious components and get rid of them faster than with uninstall instructions. A full system scan blocks virus reappearance and prevents traffic to malicious domains. Goldoffer.online is a shady domain that is used by adware program. Once this potentially unwanted program (PUP) gets into the system, it alters targeted browser’s settings and starts displaying unwanted commercial content or initiate redirects to various websites. The purpose of Goldoffer.online adware is to drive traffic to specific websites or generate revenue from users’ clicks on ads. Therefore, this ad-support application makes browsing the web unbearable in order to get as many users’ clicks as possible. 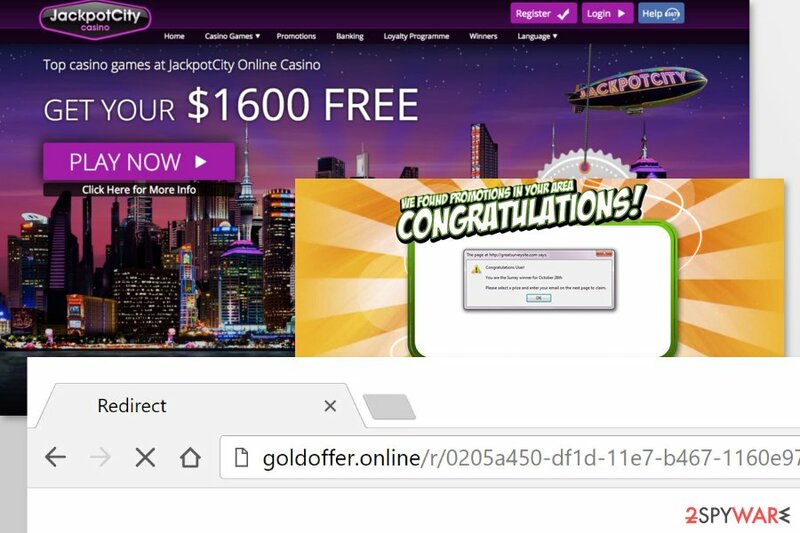 The Goldoffer.online virus might also be using a virtual layer to display ads, pop-ups, discount coupons, in-text ads, and banners on each website you visit. This content might be placed in weird places of the site or cover necessary content. Thus, infiltration of adware makes browsing the web an unbearable activity. Typically, Goldoffer.online ads promote unknown security software, give great shopping offers or discount coupons to shop in various online stores. However, most of the times these ads give misleading or fake information. Thus, clicking on them is not recommended. Usually, adware collects browsing-related information in order to display targeted ads. According to marketing research data, users are more willing to click on such ads. However, they might have barely something in common with a landing page. Researchers warn about highly suspicious and potentially dangerous Goldoffer.online redirect tendencies. Once you click on advertisements or get forcedly redirected to the third-party site, you might end up on a malicious, phishing or tech support scam website. Thus, you might be tricked into installing malware or reveal personally identifiable information to cyber criminals. For this reason, users are advised to remove Goldoffer.online immediately. Elimination of ad-supported applications is generally not difficult. Thus, you should get rid of it manually without any problems if you follow our instructions delivered at the end of this article. However, if Goldoffer.online removal guide seems complicated or you simply want to speed up this procedure, you should obtain an anti-malware software (for instance, Reimage) and let it delete the virus for you. All you need to do is to install the program, update it and run a full system scan. Aware can redirect users to questionable websites via Goldoffer.online domain. Goldoffer.online hijack is often unexpected. However, security specialists from the losvirus.es report that most of the time similar PUPs enter the system with the help of freeware or shareware installers. Developers of adware rely on software bundling technique that allows attaching PUP to any freeware installer. Thus, if a user installs the desired program using Standard/Quick settings, she or he gives indirect permission to download the whole package without knowing what is inside. In order to “unpack” the software bundle, you have to use Advanced/Custom installation settings. They allow seeing the list of “optional downloads” and rejecting their installation by removing pre-selected ticks. To remove Goldoffer.online redirect virus, you have to terminate adware alongside with its related components. For that, you can follow our provided instructions below. However, do not skip any of the steps and do not forget to reset each of the web browsers even though you are not using them. Adware may have injected helper objects or other entries that can help to re-hijack. However, the easier Goldoffer.online removal option is to rely on professional security software. Thus, if you want to speed up this procedure, you should download one of the suggested tools below and scan the device with it. Here, look for Goldoffer.online or any other recently installed suspicious programs. Wait until you see Applications folder and look for Goldoffer.online or any other suspicious programs on it. Now right click on every of such entries and select Move to Trash. When in the new window, check Delete personal settings and select Reset again to complete Goldoffer.online removal. Once these steps are finished, Goldoffer.online should be removed from your Microsoft Edge browser. Here, select Goldoffer.online and other questionable plugins. Click Remove to delete these entries. Now you will see Reset Firefox to its default state message with Reset Firefox button. Click this button for several times and complete Goldoffer.online removal. Here, select Goldoffer.online and other malicious plugins and select trash icon to delete these entries. Click Reset to confirm this action and complete Goldoffer.online removal. Here, select Extensions and look for Goldoffer.online or other suspicious entries. Click on the Uninstall button to get rid each of them. Now you will see a detailed dialog window filled with reset options. All of those options are usually checked, but you can specify which of them you want to reset. Click the Reset button to complete Goldoffer.online removal process. ^ Alexandra Ossola. How adware invades your computer and steals your personal data. The Week. Breaking news and current events. ^ Los Virus. Los Virus. Spanish cyber security news and malware reports. ^ Browser Helper Object. Trend Micro. Provides enterprise data security and cyber security solutions for businesses, data centers, cloud environments, networks, and endpoints. This entry was posted on 2018-01-23 at 09:32 and is filed under Adware, Viruses. You can quickly scan the QR code with your mobile device and have Goldoffer.online manual removal instructions right in your pocket. How did you remove Goldoffer.online?